Looking at themselves in a mirror, many youths and girls wrinkle their noses in disappointment. Pimples grow as fast as mushrooms making life of the young unbearable. Sometimes it seems this process cannot be stopped but it’s not true. One can surely cope with acne or at least make it less plentiful and visible. We all know that usually acne is the problem of young people. The body starts to mature and change at hormonal level. It is precisely excess of hormones that makes pimples appear on a face and on a neck, and sometimes – on a back. The balance restoration goes on by itself and the only thing that we can do is taking brewer’s yeast with vitamins and minerals. Though their usage also won\\’ t make your face clean, but will only retard the process. In case if you don\\’ t see effect after 1-2 weeks of taking of these pills, you\\’ d better not proceed as you don\\’ t need other side effects of such vitamins. It should be noted that in spite of the fact that all people have hormonal changes, not everyone suffers from acne. Young men and women with fat or mixed skin tend to struggle with these distressing manifestations. It is very easy to test your skin type: if you have fat skin, it becomes difficult to make clean your face without soap during washing. In this case traces will remain on a fabric if you have washed your face and blotted skin on your nose, cheeks by thin tissue. Pay attention to the fact that pimples mostly appear on a nose, cheeks, forehead, and above upper lip as well. Those are spots mostly inclined to impurity and secretion of fats. One of the main reasons of excessive fat level of your skin is constant intoxication of your bowels and your blood. Of course, if you stop smoking, drinking soda, coffee and alcohol, eating fast food and start drinking more kefir and green tea, eating more fruits, vegetables, greens, cooked cereals and soya, will be a great help for your skin. Another way to refine your body, skin and to get rid of acne is to drink more water, especially melt water. All photo models, who have perfect skin and who look at us from TV screens and magazines, drink no less than 2-2.5 liters of still water and have no acne. You can do the same. Put somewhere in your room a nice carafe with water and you won\\’ t forget about drinking, as it is always in front of your eyes. It’s banal but true. Ideal cleanness of skin will help you to cure acne naturally. Now I will tell you how to look after inflamed, fat skin. Pretty often in order to get rid of the pimple we try to squeeze it out. And the next day we find it twice bigger with three smaller neighbors around. This is the result done by our own hands. Certainly, sometimes we need to do mechanical cleaning of the face and to simply squeeze out everything we can. But it’s necessary to do it right. Imagine the consequences if a surgeon cuts the appendix with unsterile scalpel. I think that at the best the patient will have to receive treatment for infection, and if neglected the disease could lead to lethal result. Squeezing the pimples out with your skin not prepared in advance, you also risk your health. Widely open pores are typical for a fat skin. That is why it easily and quickly becomes dirty. Such skin requires special and careful treatment. Motes remains, getting into the pores, are the very factor, that provoke most of the pimples appeared. That is why the cleaning must be regular: daily with any cleaning agent and 2-3 times a week with deep cleanser. At first you will need a usual washing with soap or washing foam. If you\\’ ve got combined skin, then apply cleaning agents only on fat areas. Washing should be done by warm water followed by cold water rinsing after complete removal of cleaning agents. Why do you need that? Warm or hot water promote pores widening and their better cleansing. Cleaning agents destroy fat layer and take it off your skin. Cold water will plug up the pores, blocking the access for dirt and bacteria to the deep layers of your skin. Consolidate the washing by wiping your face with the help of cotton swab impregnated with a lotion. Today the choice is really wide. I am skeptical about advertised expensive products, as my life showed that expensive does not mean effective. So you can buy any lotion you like. The main thing is that it must be alcohol free. Alcohol, of course, promotes skin defatting and disinfection, but at the same time destroys the protective layer. It is much better to apply antibacterial tonics, cucumber lotions, good quality salicylic tonic. Pay close attention to the composition and herbal extracts included. Aloe, Sticktight, Celandine are perfect for regenerative process. Chamomile, Melissa, cucumber are good abirritants. Presence of these herbs in tonic will provide skin protection and healing. In summertime use decoction from these herbs, obtained by steaming of approximately 2-3 teaspoons with boiling water, and after that wipe your face with this potion after each washing. You can use herbs separately or together. Don\\’ t use creams. Young skin, especially fat, is not inclined to early aging and wrinkles appearance. In does not require constant additional nourishment. The only case when creams are reasonable is treatment of inflamed areas by healing ointment. There are many types of them. I personally like Boro Plus. It promotes irritation removal, heals the sores and the scars. I won\\’ t write about its other medicinal characteristics, but the ointment of such type is indispensable helper in my medicine chest for the whole family. Forget about such cosmetic preparations as toners, powder, and rouge. None of them really hides the defects from acne, even if applied in 1 cm layer. Though it for certain plugs and clogs the pores. The more you use them, the more the irritation of your supersensitive skin. Steam your face out over vapor bath. It is prepared very easily. Boil water in a pot, with herbs if you wish. Bend over it and cover yourself with large dense towel. 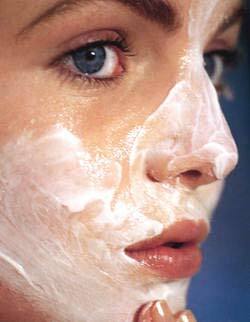 In 10-15 minutes your skin will be steamed out and become more pliable, its pores will open. Press carefully, better use plastic cosmetic sticks. Squeeze the pimple from different sides in order not to damage the skin around it. All pimples have a so-called rod – solid contents. Keep squeezing the pimple out till these contents are completely out or else the inflammation will become stronger. After you will remove everything you wanted, wash your face with warm and then with cold water as during regular washing. Cold water washing can be replaced by rubbing with ice cubes within 30-40 seconds. But no longer in order not to get your skin “weather-beaten”. Ice cubes can also be prepared from herbal decoction. After mechanical cleaning on no account use any creams within one day. Just wipe the face with herbal decoction. The procedure is done 2-3 times a week with the help of scrubs. The face should be streamed out beforehand, the same way as in mechanical cleaning. In the end of cleaning you should treat your skin with a lotion. You can use scrub-peeling, removing upper layer of epidermis and promoting faster growth of new cells. Following this advice you will easily keep your skin clean and get rid of acne. Remember, first of all, it’s necessary to provide cleanliness and care, and then healing.